Elena also has one of the youngest Therapy Dogs Nationwide supporters, her son Morgan (age 3). As well as being a visiting volunteer, Elena is a friendly face with a ‘good ear’ to help support our volunteers. 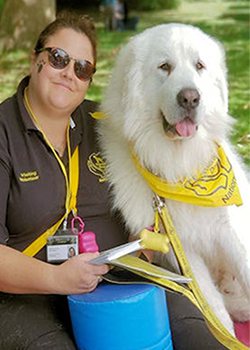 She firmly believes the volunteers ‘furry’ or otherwise are the “beating heart” of Therapy Dogs Nationwide and takes supporting them very seriously. If anyone has any queries or concerns and would just like to have a chat, Elena is your go-to person.